Usually, football previews are most interesting for teams that might lose. Once again, that should not happen to now-#2 ranked Oregon this week. I know, I know, I hedged slightly. I came real close to using "will not," but considering how ridiculously easy last week was and this week is Mark Helfrich's first away game as head coach and this is really, really an away game (Charlottesville, Virginia is about as far "away" as a team from Oregon can get) there is that conceivable chance that Oregon could lose. 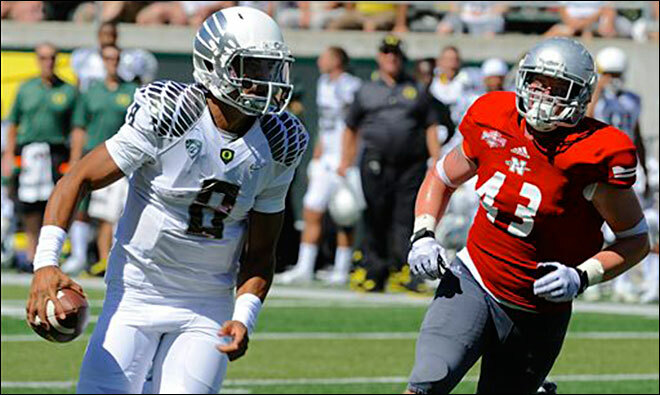 For the second week in a row, Oregon will play a team for the first time. You remember how last week worked out for the first-time opponent, don't you? Well, Virginia did win last week, but they punted 13 times in beating BYU 19-16. 13 times? Yep. Virginia became the first team this century to punt at least 13 times and win. Now, I don't know about you, but I don't think they can punt 13 times against Oregon and win. Hell, Nicholls State punted seven times and lost 66-3. You see where I'm going with this? Then there's Virginia's record against teams ranked in the top three. It's not good. The last time it such a game happened in Charlottesville was against another Pac-12 team: #2 USC in 2008. Final score 52-7, Trojans. Virginia is 2-17-1 against teams in the top five all time (you can figure out when the tie was, I hope) and 2-6-1 at home. Those two wins? Also against FSU: 1995, when the 'Noles were #2 (33-28) and 2005, when the 'Noles were #4 (26-21). The 1995 win gave Virginia the ACC championship. The 2005 team promptly lost the next week to North Carolina, 7-5. Then there's Oregon on the road, no matter the opponent: Oregon has not lost away from Autzen at a non-neutral site (read: a Bowl game) since falling to Stanford 51-42 in November of 2009. That's two big wins at Stanford, two big wins at USC, Arizona, Arizona State, Oregon State, Washington, Washington State, Cal.... everywhere. That's 15 in a row, the longest current streak in the country, six ahead of Alabama (hey, Oregon's ahead of Alabama in something!) and Northern Illinois. What's this mean? It means the Ducks aren't Florida State. Some have written that the Cavs d-line succeeded because they were "aggressive" against BYU, but Oregon's offense tends to shine against aggressive defenses, because they over-pursue, allowing the Ducks to run "delays" (that is, hanging on for the extra half-second they usually don't do) and gain big yardage. So it hinges on Marcus Mariota, again, reading that "aggressive" defense and going the other way with it. Virginia's D might have early success, but I expect the Ducks to regroup and make it not much of a question by halftime. As for Virginia's offense? Nothing doing. 19 points and 224 total yards last week.... and 13 punts, remember? Oh, final word on this one: Those 13 punts went 537 yards, which is a hell of a lot. Oregon had 772 yards of offense last week. Case closed. And "away" they go.